The Kelvin-Helmholtz (KH)-induced surface waves and vortices is one of the significant mechanisms to transport the solar wind into magnetosphere during northward interplanetary magnetic field (IMF) conditions. However, due to the limitation of the in-situ spacecraft observations and localized modes, the global features of the K-H waves at the magnetopause are seldom investigated so far. 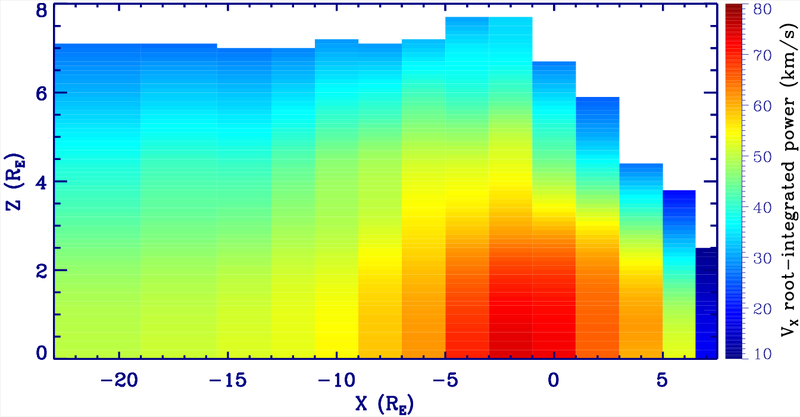 LI Wenya , WANG Chi, TANG Binbin, GUO Xiaocheng and LIN Dong from the State Key Laboratory of Space Weather, National Space Science Center, reproduced the Kelvin-Helmholtz waves at the low-latitude magnetopause boundary layer during the northward IMF conditions, using a self-developed global MHD simulation model (PPMLR-MHD). It is the first time the global features of the K-H waves have ever been studied. 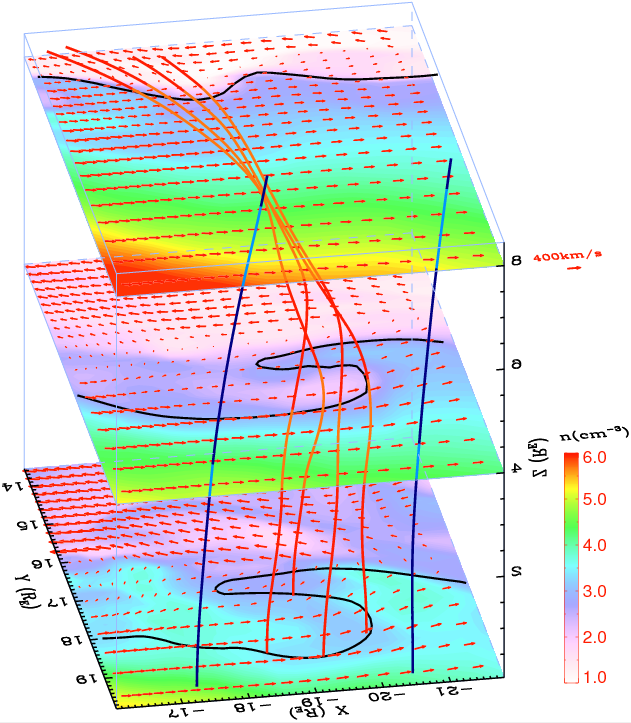 The simulation results show that the K-H active region expands latitudinally towards the middle-latitude in the dayside magnetopause, while the K-H active region saturates in the nightside magnetopause. Additionally, the maximum perturbation amplitude locates at the dawn/dusk terminator regions, controlled by the global configuration of plasma flow and magnetic fields. In the dayside magnetopause, the phase of the waveforms at middle latitudes leads to that at low latitudes, while the situation reversed in the nightside; the transition happens at the two terminator regions. The authors therefore concluded that the global evolution of K-H phases is a representation of an interesting feature that the axis of the K-H vortex aligns with the geomagnetic field lines. These findings, in the view of global magnetosphere, will deepen our understanding of the spatial evolution and distribution of K-H waves. 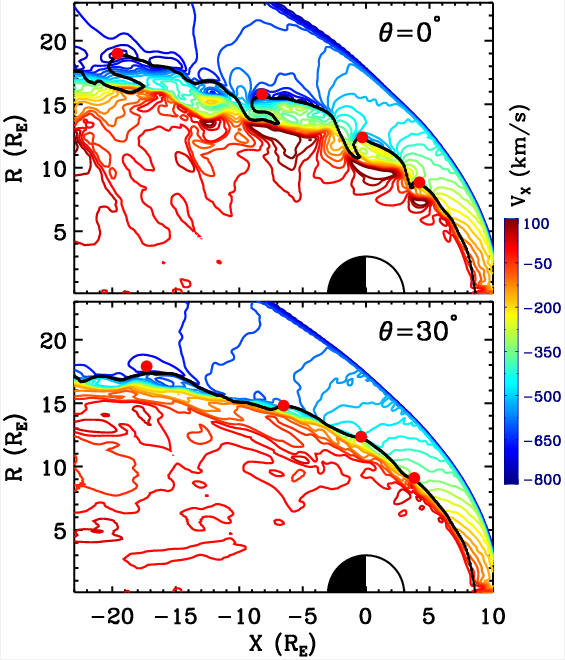 The work entitled Global features of Kelvin-Helmholtz waves at the magnetopause for northward interplanetary magnetic field was published on Journal of Geophysical Research-Space Physics hosted by American Geophysical Union(AGU).